Una solución innovadora para garantizar total privacidad mientras se trabaja en el computador. 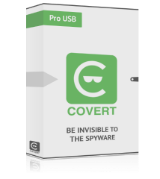 COVERT Pro - una solución innovadora para garantizar total privacidad mientras se trabaja en la computadora. Protege contra spyware y tiene mensajería instantánea con cifrado. Al trabajar en una plataforma segura, todas las acciones de los usuarios en todas las aplicaciones (navegadores, clientes de correo electrónico, software de oficina, mensajeros, etc.) se ocultan con seguridad. La captura de datos desde la entrada del teclado y la pantalla del monitor está bloqueada. El uso de las funciones especiales de COVERT Pro (Monitor de red, Monitor de controladores, Procesos del sistema, Servicios del sistema) le permite detectar y eliminar todas las aplicaciones ocultas. COVERT Pro le permite bloquear el micrófono. 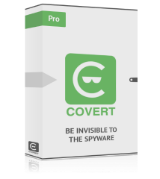 COVERT Pro increase the security level of your PC and provides confidential work and correspondence. Compatible with antivirus. It would be nice to know a little more about the developers behind the software, since this is a new software and especially since GOTD is advising us to disable our own system's protections to install this product. Who are the developers and what other (reputable) products have they created in the past? Does GOTD indeed have all the expertise needed to test that this software is purely for the customer's benefit and will not install any backdoors in my system?? It would be nice to know a little more about the developers behind the software, since this is a new software and especially since GOTD is advising us to disable our own system's protections to install this product. Who are the developers and what other (reputable) products have they created in the past? Does GOTD indeed have all the expertise needed to test that this software is purely for the customer's benefit and will not install any backdoors in my system?? Thanks. The ZIP contains the installer, and if you run Setup.exe, the program is correctly installed. However, the installed does NOT add the usual shortcuts in your start menu, and if you have unticked the option to create a shortcut on the desktop, the only way to launch it is to open "C:\Program Files (x86)\COVERT Pro AE" and manually launch Protection.exe. This installation problem is of course a problem, but that doesn't mean that the program itself is bad. And, of course, you can create yourself a shortcut in your start menu. The program is a sort of sandbox. I prefer the free version of Sandboxie, a very good sandbox tool, but this one might be good too. The ZIP contains the installer, and if you run Setup.exe, the program is correctly installed. However, the installed does NOT add the usual shortcuts in your start menu, and if you have unticked the option to create a shortcut on the desktop, the only way to launch it is to open "C:\Program Files (x86)\COVERT Pro AE" and manually launch Protection.exe. This installation problem is of course a problem, but that doesn't mean that the program itself is bad. And, of course, you can create yourself a shortcut in your start menu. The program is a sort of sandbox. I prefer the free version of Sandboxie, a very good sandbox tool, but this one might be good too. How to uninstall this? I don't see the program under "Uninstall or change a program" in my WIndows 7. Also checked the FAQ on your site and there's nothing on how to uninstall? Running setup will give you a notice that the program has been installed, but there is no desktop shortcut or program that I can find on my rig. I believe that's what @Frustrated is referring to! I think COVERT needs to re-check the files. Running setup will give you a notice that the program has been installed, but there is no desktop shortcut or program that I can find on my rig. I believe that's what @Frustrated is referring to! I think COVERT needs to re-check the files. By default, the installer creates a shortcut on the desktop. By default, the program will be installed in the directory Program Files/COVERT Pro AE. If this did not happen, then there are problems with the Setup.exe that you have got from GOTD. Read for Context, By default, the installer creates a shortcut on the desktop. By default, the program will be installed in the directory Program Files/COVERT Pro AE. If this did not happen, then there are problems with the Setup.exe that you have got from GOTD.